To guide towards good deeds and to forbid the person from doing bad deeds ( Amr Bil Maa’ruf And Nahi Anil Munkar ), has great importance in islam. A person has to face too many difficulties when he adopts this path. When today a man is not able to distinguish between Haq (Right) and Batil (Wrong), in such conditions it is very difficult to know Haq and to adopt it. After adopting Haq it is even more difficult to preach it to the public. It is only possible with Taufeeq and blessings of Allah. Janab Ibrahim Bhai Patel, who was born on 1.1.1944 in Tankaria, a small village in Gujarat, died on 4th Sep, 2012. He spent 40 years of his life in the darkness of Batil (wrong path). 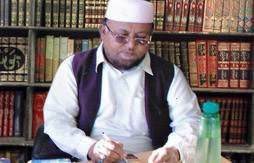 He was fond of reading books & was having love towards Islam. He was interested in finding Haq religion & at last by the grace of Allah & mercy of Ahlul Bayt he was guided towards right path. He was such a person that not only he but all his family members accepted Shiaism( The religion of Ahlul Bayt) .He worked hard for last 22 years of his life to propogate (Haq ) right path. This man, the man of great, courage, Allah has showered the great mercy and his fazl, and by this courage and mercy of Allah he not only him but all his family members, accepted the boycott of the society, relatives and friends. He was not discouraged by this boycott but faced the situation boldly. Throughout this 22 years of his right path he wrote 61 books on different subjects in Gujarati which was great gift to Gujarat knowing Shia. All his written books are made available on internet. The only aim is that momins all over the world can get benefit of all his books. readers are required to give their valuable suggestions so that this work can be proceed further.